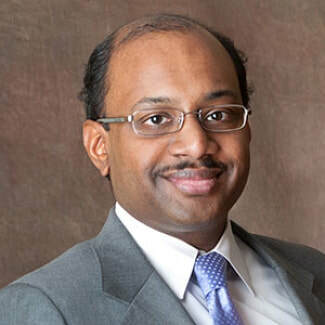 Jayakrishna Ambati is Professor & Vice Chair for Research of Ophthalmology, founding Director of the Center for Advanced Vision Science, and has joint appointments with the Cardiovascular Research Center and the Biomedical Sciences Graduate Program's departments of Microbiology, Immunology, and Cancer Biology. His scientific aspirations are to identify the molecular mechanisms underlying the development of AMD, determine the triggers of the angiogenic switch that converts this disease from an atrophic to a neovascular phenotype, and to develop novel therapeutics to prevent and treat this blinding condition. He is the first ophthalmologist to win the Doris Duke Distinguished Clinical Scientist Award, Burroughs Wellcome Fund Clinical Scientist Award in Translational Research, the Ellison Medical Foundation Senior Scholar in Aging Award, and the Harrington Discovery Institute Scholar-Innovator Award. He was also elected to The American Society for Clinical Investigation and was the first ophthalmologist to be elected to The Association of American Physicians. He has been elected as a Fellow of the American Association for the Advancement of Science. He also serves on the Editorial Board of Investigative Ophthalmology & Visual Sciences, Ophthalmic Research, and is an Associate Editor of Ophthalmology and of Translational Vision Science & Technology. He won the 2010 ARVO Cogan Award, and his Cogan Lecture was recognized with the 2010 Cless Best of the Best Award. He also won the 2010 Roger H. Johnson Memorial Award for Macular Degeneration Research, and a 2010 Research to Prevent Blindness Senior Scientific Investigator Award. He has been named winner of the 2011 AFER/Pfizer Ophthalmics/Carl Camras Translational Research Award and the 2014 CNIB Chanchlani Global Vision Research Award. In 2014, he received the NIH Director’s Pioneer Award, becoming the first ophthalmologist and the first from an institution in Kentucky, to do so. In 2015, he was elected a Fellow of the National Academy of Inventors. His wife Kameshwari and he derive the greatest joy from playing with their daughters Meenakshi and Vidya, and exploring TED Talks.